One of the most commonly overlooked sources of health issues in the home is your basement. Cellars may flood for several reasons in any weather, and there are entire neighborhoods where landlords and real estate agents subscribe to the motto “If you have a basement, you will have flooding.” Flooding increases the risk of mold in your basement, which could lead to potentially deadly health issues. When dealing with a flooded basement, there are three important questions you must ask: “Why did it flood?”, “How do I properly clean the basement?”, and “How do I repair any damages?” While you cannot completely protect your basement from water, a properly built and maintained basement should not be prone to flooding. By addressing all three questions, you may not only recover from a flooding, but also help prevent future floods. Even if your basement hasn’t flooded yet, understanding the potential causes will help you to reduce the risk of flooding. In the event you have suffered a flood, identifying the source will help with repairing damage and may be vital in determining how you handle the cleanup. Unlike other sources of flooding, sewer backups require special care when cleaning. Backups may be caused by several reasons, but the most common are clogged drains, a full septic system, items other than toilet paper and human waste being flushed down the toilet, and a damaged sewer lateral. Sewage flooding most often appears where your sewage pipes connect to the sewer lateral pipe and in basement drains such as a floor drain, sink, or cellar bathroom. The best ways to prevent sewer backups are to have your lateral pipe inspected every five to ten years, watching what you flush, and regularly pumping out your septic tank if your home has one. Be warned that raw sewage can cause numerous health hazards, and a sewer backup will result in the necessity to dispose of many items you would normally be able to salvage. Heavy rains may result in flooding by one or more sources. For example, cracks in the foundation may allow water to seep in as the ground becomes saturated. Homes set at lower elevations or at the bottom of hills may be more susceptible to this form of flooding due to runoff. In some cases where the lot grading gently slopes down towards your home, you may see some flooding. Another, less obvious source of rainwater flooding is your downspout system. Downspouts which are not properly aimed away from the home may deposit rainwater along the foundation where it finds a way into your basement. 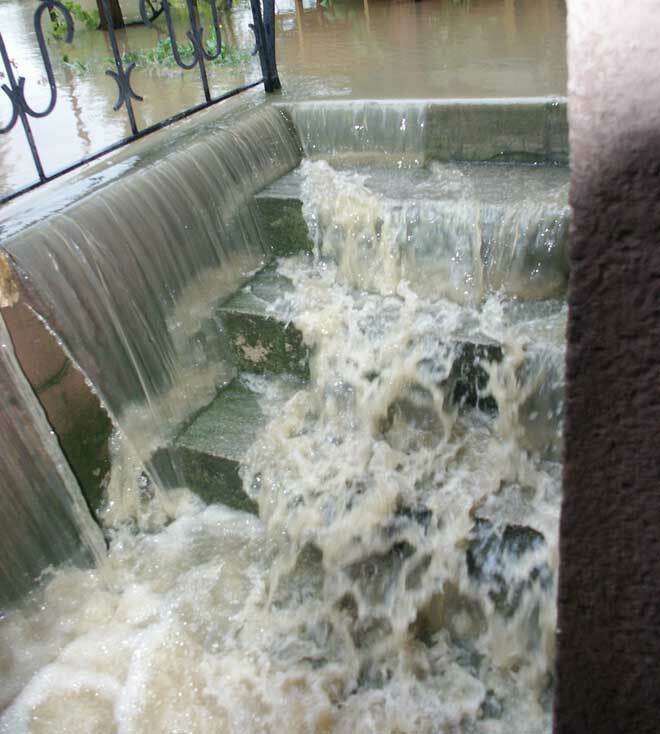 Clogged gutters also contribute to this problem, as water overflows the gutter and pours along the foundation. Keeping your gutters free of debris and making sure your downspouts lead away from the home are simple, yet effective methods to reduce the risk of rainwater flooding. The third cause of rainwater floods is a result of hardened soil. A drought causes the soil to pack and harden, making it unable to absorb the rainwater efficiently. Poorly aerated soil or high amounts of clay present are other common causes of ground hardening. 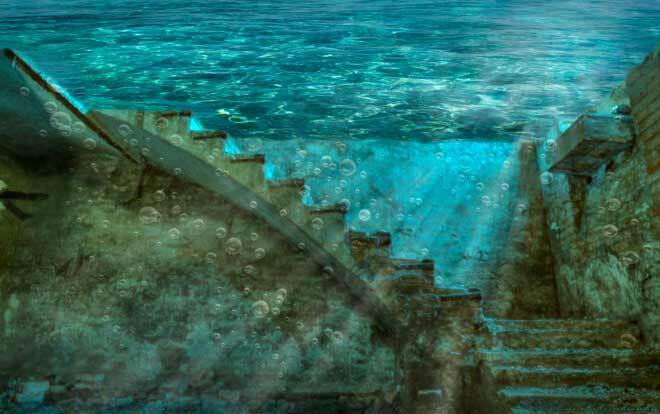 During a heavy rain, most of the water pools above ground and eventually finds its way into your basement. Finally, groundwater levels may play a key role in storm flooding. Many homes, especially older ones, have a basement which is at or below groundwater levels. In some older communities, homes were even built on swamps or on filled-in lakes or streams. Excessive rains will raise the water table, causing an increased risk of flooding in such homes. Your local records office will be able to provide information on the local groundwater tables and any prior bodies of water that may affect your property. If your home is at or below the groundwater level, be sure to have your weeping tiles regularly inspected to reduce the risk of flooding. While humidity may not cause visible flooding, it can lead to similar damage, especially mold. Check your basement’s humidity levels to see if you need to install a dehumidifier. As high humidity in basements is a common problem, this simple fix could significantly reduce the risk of mold and other moisture-related damages. A clear sign of excess moisture is the presence of white powder along the foundation or walls. Air leaks contribute to humidity, which is a less visible cause of water damage. It is important to periodically check for these leaks and seal them. Examine the frames of any windows for rot or damage to the seals. Replace the caulking or entire frame as necessary. Another common source of leaks is the rim joist. This board supports the floor beams and sill plates above your foundation. Gaps around this or the sill plate should be sealed to prevent humid air from seeping in from the rooms above. In the event of flooding that doesn’t involve sewage; you will need to follow several simple steps before attempting salvage or repairs. Never enter a flooded area without shutting off power first. Once the power is off and the flooding has stopped, you will need to use a pump to remove the water. Next, take all items out of the affected area and place outside or on your porch or deck for sorting. Scrub the floors and walls with an anti-bacterial cleaner to help reduce the risk of mold forming. Finally, open any windows or use fans to speed up the drying process. While your first instinct may be to try and salvage any carpeting, it is best to dispose of anything that cannot be washed. Carpets have a layer of backing which may remain damp even when the surface feels dry. This creates the perfect environment for mold and may also attract roaches and other insect pests. If you have smaller throw rugs, be sure to wash and dry them thoroughly. Depending upon the function of the flooded area, you may have to make special considerations when deciding what can be salvaged. Cardboard boxes should be discarded and the contents sorted and placed into Tupperware containers. Furniture must be carefully cleaned with an antibacterial solution and may need to be discarded if upholstered. Finally, electronics which have been exposed to water should not be used while damp. You may have to take them to a repair shop if more than the cord was affected. Raw sewage presents a serious health hazard, making basement floods caused by a sewer backup the most costly. To avoid the risk of contamination, it is important that you wear protective clothing and clean thoroughly. Take photos of the flooding for insurance purposes before cleaning. You will need to wear protective eyewear and clothing, including rubber gloves and boots. Shut off electricity to the area before coming into contact with any standing water. Next, use a sump pump, wet vac, or rag and bucket to clear away the water. Opening the windows or running fans will help dry the room more quickly. Carefully dispose of any solid waste and anything which has come into contact with the wastewater. Unfortunately, any contaminated carpeting or furniture must also be disposed of. Scrub the entire area to remove any remaining sewage or dirt and allow to dry again. Finally, use a solution of one part bleach per nine parts of water or a strong antibacterial cleansing agent to give the entire area another thorough scrubbing and allow it to air dry a third time. Over time, your concrete walls may become damaged from soil pressure and water seepage. The most visible signs are chips or cracks. It is possible to repair this damage yourself, although you should consult with a professional if the damage is extensive. As the patching process takes several days, plan your repairs when no storms are expected. Cracks are a sign of damage deeper within the wall. In order to effectively patch the damage, you must first remove the subsurface damage and clean out any dust or dirt. To do this, take your cold chisel and place it in the crack at a slight angle. Tap gently with the hammer to make the interior of the crack at least twice as wide as the surface. This process is known as undercutting. Next, use the wire bush to remove any dust or debris from the area and pour the cup of water into the crack to flush out any remaining debris. Perform this surface cleaning on chipped areas as well. You will need to let the cleaned areas dry for up to one day before continuing. Pour the patching compound into your bucket and mix, following the instructions on the package. Once mixed, remove a golf ball-sized amount using your putty knife and push it into the damaged area. Be sure to push the compound deep into any cracks. Once the affected area is over-filled; take the putty knife and scrape the patch flush with the wall. Cover the patched area with plastic sheeting and carefully seal with duct tape. Make sure that this seal is airtight. Once the seal is confirmed, gently peel open the top and spray water into the covered area. Reseal and repeat every 24 hours for five days to complete the patching process. Mold is most often found in the basement and some varieties may be potentially life-threatening if not treated. While an infestation may occur at any time there is an excess of moisture, the risks are even more prevalent after a flooding. If you were unable to clean up a basement flood immediately, you may have the beginnings of a mold infestation. You can often identify the presence of mold from the smell even if you can’t see physical signs. If caught early, it is possible to remove the mold yourself. For larger infestations, it is best to hire a professional. Spray the moldy areas liberally and thoroughly scrub with a sponge. Be sure to remove all traces of dirt from the wall. Open any windows or doors to ventilate the area before proceeding to the next step. Fill the bucket with a concentrated mixture of one cup bleach to one gallon of warm water. Heavily scrub the mold using your brush and solution. Take breaks as needed, as this is often a long process. Once the mold has been completely removed, soak the area in the bleach solution for another 15 to 20 minutes to kill any remaining microbes. Finally, use a clean cloth to thoroughly dry the wall. Canada’s Institute for Catastrophic Loss Reduction has created a handbook with useful information on reducing the risk of flooding both in your home and your community. Flood Smart is the official site for the National Flood Insurance Program, which provides flood insurance in participating communities.